Heathrow expansion - did your MP vote for climate action or climate breakdown? In 2008, the House of Commons voted on the Climate Change Act. It passed almost unanimously across all parties, with just six MPs voting against. Ten years later, MPs have faced another significant vote: whether to increase aviation emissions by building a new runway at Heathrow. It was a clear choice between climate action or climate destruction. And MPs voted for the latter, 415 to 119 in favour. 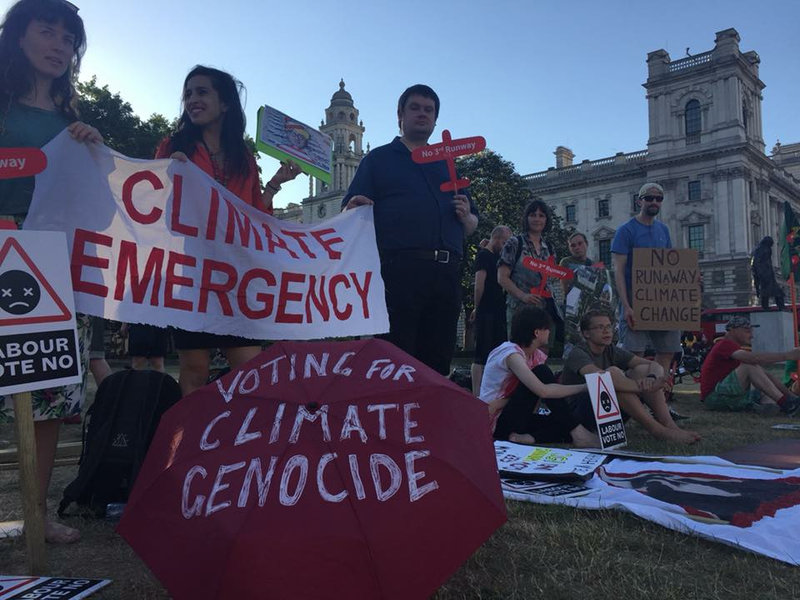 Campaigners, while expecting a defeat, were nonetheless appalled by the scale of it, asking how avoiding catastrophic climate change could be so lightly set aside by so many. While the Conservatives faced a three-line whip, and SNP at the last minute changed their promised support to abstention, Labour MPs had a free vote. 119 of them voted for Heathrow expansion. Did they not understand that this would make it very unlikely we could meet our climate targets (the UK Climate Change Act, let alone the more stringent requirements of the Paris deal)? Despite government assertions to the contrary, the evidence was clear on this. The Committee on Climate Change explained that to allow aviation emissions to grow beyond the limit they had set would blow our carbon budgets. And the experts patiently pointed out that all theories of how a third runway could be built without breaching these were completely implausible or impossible. One problem was that campaigners and academics did not succeed in overcoming the vast sums of money poured by Heathrow Ltd into lobbying, and the support of influential union Unite, to expose the flaws in the perceived economic argument. Most MPs believed that there was a strong economic case for expansion - very far from the truth. But even if they were convinced that abandoning a significant pillar of our national responsibility to tackle climate change would literally pave the streets of London, Birmingham and Manchester with gold, MPs should value our climate commitments beyond this. Despite reports published just before the vote that Antarctic ice had accelerated, melting three times as fast, it is clear that the vast majority of MPs simply lack any sense of peril to human civilisation as we know it. Nor do they understand the immediacy of climate change - the deadly combination of global warming and economic injustice is already killing people around the world. If they had, they would not have voted to emit, every year, additional CO2 equivalent to that of a small country, when we are already failing to meet our climate targets. They have surely been helped in this sense of complacency and insulation from reality by mainstream media. This almost universally framed the choice facing MPs as national economic benefit vs local air pollution - at best a vague mention of 'environmental concerns'. So who voted which way? Credit to the eight Conservative MPs who went against their party whip and voted against, even if climate change may not have been at the top of their minds (for example Justine Greening managed to write an article - eight reasons to oppose Heathrow expansion - without mentioning climate). All were representing their constituents' concerns around Heathrow with the exception of David Amess, MP for Southend West. Plaid Cymru all voted against. SNP abstained. Unfortunately, abstaining from climate change is not an option. With Labour MPs having a free vote, and Labour leaders advising that a third runway did not meet their climate (or other) tests for support, those who voted for, or abstained became a depressing roll call. Honourable mention goes to John McDonnell who spoke eloquently in debate against a third runway - unsurprisingly since he is a long-time opponent, as did Andy McDonald, shadow transport secretary. Clive Lewis wrote an excellent article urging his colleagues to vote against, and of course Caroline Lucas of the Green Party has been a voice of sanity throughout. Constituents who urged their MPs to vote against may have felt they were ignored, but at least one MP was persuaded by his constituents - Darren Jones (Bristol North West) appears to have been persuaded by personal appeals to vote 'no'. Others who have spoken out fervently against social injustice (such as David Lammy) voted in favour of a third runway and appeared not to realise that this meant voting for not just local but global injustice affecting the poorest around the world on a massive scale. Of those who have signed the Climate Coalition's current letter urging the government to strengthen our climate targets to reach net zero before 2050, a majority actually voted for the third runway. This included Labour MPs Ben Bradshaw, Alex Cunningham, Paul Farrelly, Kate Green, Harriet Harman, George Howarth, Peter Kyle, John Mann, Siobhain McDonagh, Catherine McKinnell, Madeleine Moon, Toby Perkins, Virendra Sharma and Jeff Smith who chose to do so on a free vote. A particular disappointment was Mary Creagh, chair of the Environmental Audit Committee, choosing to abstain despite stating that the environmental case against was 'unconscionable'. Not all hope is lost on the third runway: it may well never be built as the councils of Wandsworth, Richmond, Hillingdon and Hammersmith and Fulham, together with Mayor of Lonodn, Sadiq Khan, and Greenpeace, are launching a judical review. And yet the future looks bleak. We have been shown how much our elected representatives value a safe and stable climate for future generations, how much they value security of livelihood, food and water for the poorest across the planet. And the answer seems to be "Not much".